Perceptions have shifted since Solskjaer's appointment in December"A shambles." "Absolutely hilarious." "United writing off their season. "Ole Gunnar Solskjaer's appointment as interim Manchester United manager in December was met with a good deal of scepticism.Some fans, like Mufaro, were so opposed to the appointment they thought what may have seemed unthinkable in the dark final days of Jose Mourinho's tenure. Despite his legendary status as a player, Solskjaer's return raised a few eyebrows - particularly after his doomed spell as manager of Cardiff City, who were relegated from the Premier League under him.Speaking on BBC Radio 5 Live, former United director Edward Freedman said the news "doesn't excite me" while ex-Red Devils midfielder Darren Fletcher said the club risked "writing off" the next two seasons by appointing an interim manager. The people's poet: "Nice to see a Man Utd manager SMILING for once. "Some fans, however, saw past the smiles...Robo: "Same old story. Overpaid, spoilt players withdraw their labour until the nasty man who shouts at them has gone, then switch it on again. Not a thought for the supporters." 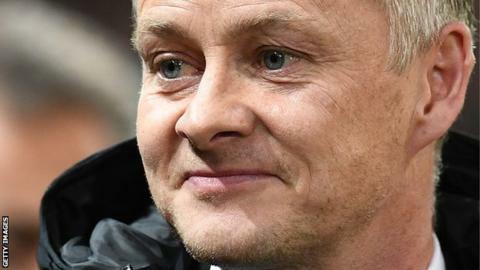 Matches at Tottenham and Arsenal are never easy for an interim manager hoping to impress a new employer - and especially when that employer is a club of the stature of United.But Solskjaer laughed in the face of such adversity - his side won 1-0 at Wembley and 3-1 at Emirates Stadium. The latter, by the way, made it eight wins from eight matches since his appointment.In his match report of the Tottenham game, BBC Sport's chief football writer Phil McNulty said: "Solskjaer has given a disaffected squad unity of purpose once more... and this run of wins has rebuilt fractured confidence and belief." Mohamed: "Madrid had Zidane, Barcelona had Pep, Solskjaer is Man Utd's version of the two. "Samuel James Lee: "Saying things and doing things a Man Utd manager should." Unbeaten runs have to end at some point. In Solskjaer's case, it was 12 matches in. A Tuesday night in February and a 2-0 home defeat by French champions Paris St-Germain in the Champions League's last 16.McNulty described it as the Norwegian's "toughest night", adding: "He will not give up hope but logic suggests this is the end of the road for Manchester United's Champions League ambitions." Adrian: "Oh wow, you mean super Solskjaer, the manager of the century, actually lost a game[/IMG]Mark: "Out of his depth tonight - he looked like he was going to cry." Finkelstein: "Brilliant United. Old Trafford will be renamed 'Ole's Trafford' Brilliant win. From a Spurs fan. "Jenny: "Suddenly I'm back in 1999. Smile on my face. Thanks OGS." Even the haters couldn't help but appreciate a football masterclass.A. M. Peacock: "Amazing. I've grown up hating Man Utd but even I want to see Ole succeed." Just four days after that amazing night in Paris, United failed to spark on Premier League duty, losing 2-0 at Arsenal.Another six days on, they were out of the FA Cup after a 2-1 defeat by Wolves at Molineux. If you are viewing this page on the BBC News app please click here[/i] to vote.